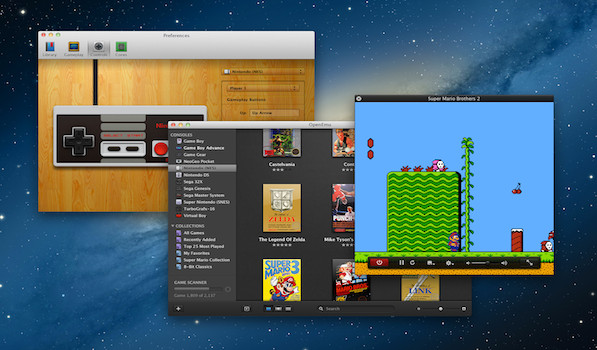 OpenEmu is an open source video game emulation app for Mac that aims to bring all your favourite consoles to you in a single gorgeous app. The app uses a dark theme throughout and has a beautiful retro icon that is reminiscent of an arcade controller. I’ve been looking for a way to play the Game Boy Advance version of Final Fantasy IV on my Mac and downloaded OpenEmu on Mikhail’s recommendation. When I first opened the app, I wasn’t expecting it to be very good-looking. However, I was pleasantly surprised when I saw the attention to detail. The dark colour scheme in OpenEmu fits really well with the app and I absolutely love the mini console icons used in the app’s side bar. The preference pane of the app uses delightful icons and has amazingly well made versions of every supported console’s controller. Apart from just looking good, OpenEmu is very simple to use. The app comes pre-packaged with several console emulators and gives you the option to install them just by checking on which ones you want. OpenEmu uses open source cores for emulating consoles such as the Nintendo DS, NES, SNES, Game Boy, Game Boy Advance, Sega 32X, Game Gear and more. The app even gives you a Game (ROM) Starter Pack through their website to get you going. You can add your own games to the app via ROMs simply by dragging them in. If you already have some ROMs on your Mac, OpenEmu finds them automagically and adds them to your collection. If this wasn’t enough, the app also adds each game’s original box art to your library. You can organise your games as collections which show up in the side bar under your installed console emulators. Viewing your game library as a collection of boxes in cover-flow feels awesome. Starting a game is as simple as double clicking on a ROM. The emulation begins almost instantly and everything I’ve tried so far has worked well. OpenEmu can integrate with hardware controllers and has provided a list of supported controllers on their GitHub page along with other useful information. You can configure the controller through the slick Controls tab in the Preferences menu or just use the keyboard instead. During gameplay, you can save your game at anytime by clicking the ‘save’ button in the emulator, something I found extremely useful while playing FF IV. If you exit the emulation during gameplay, OpenEmu remembers where you left off and starts the game from there the next time you launch it. I only faced one issue while saving a game in OpenEmu. Attempting to overwrite a save file by tapping on it causes the emulation to begin from the previous save point instead of overwriting. It’s better to create a new save file. If you’re like me and want to play some of your favourite old games (ROMs) on your Mac, you should definitely check out OpenEmu, you won’t regret it. It’s available for Free on the OpenEmu website.